AT SOME convenient point in any morning, Tom Wolfe would put on his working clothes. Over a silk shirt, maybe ultramarine, maybe striped, he knotted a silk tie. A proper Windsor knot! No plastic cheaters, like Marshal McLuhan! Then a perfectly tailored white suit of linen or silk tweed…with double-breasted vest…dark blue trim of the matching square peeking from the breast pocket… cream socks . . . leather spectator spat boots…the summer passeggiata gear of Richmond, Virginia, his home town, transposed to New York. A glance in the mirror—the face fine, a china doll’s, with hardly a suggestion of shaving. The underlip puppet-stiff, but the hair floppy in the English style, falling almost to the intertragic notch of his ear. Work was not far to find, across a few dozen metres of parquet flooring, past orchids and butter-yellow sofas, to his study in his apartment on the Upper East Side. There stood his desk. His desk! A brass-galleried horseshoe in light oak sporting silver inkwells in the shape of top hats, paperweights of millefiori Murano glass, an apothecary’s balance scale, family pictures in silver frames, a silver-footed chalice of blue Bohemian glass and a figurine of Bugs Bunny. At 90 degrees to the command centre of the desk was a typewriter with the blank paper set. Ready to write! Ten pages a day! Triple-spaced! Forcing himself to do it! But every so often—he would pause—smoothly swivel—to consult his huge thumb-indexed and stand-mounted Webster’s for “tabescent” or “prognathous”. Tom Wolfe was born and raised in Richmond, Virginia. He was educated at Washington and Lee (B.A., 1951) and Yale (Ph.D., American Studies, 1957) universities. In December 1956, he took a job as a reporter on the Springfield (Massachusetts) Union. This was the beginning of a ten-year newspaper career, most of it spent as a general assignment reporter. For six months in 1960 he served as The Washington Post’s Latin American correspondent and won the Washington Newspaper Guild’s foreign news prize for his coverage of Cuba. In 1962 he became a reporter for the New York Herald-Tribune and, in addition, one of the two staff writers (Jimmy Breslin was the other) of New York magazine, which began as the Herald-Tribune’s Sunday supplement. While still a daily reporter for the Herald-Tribune, he completed his first book, a collection of articles about the flamboyant Sixties written for New York and Esquire and published in 1965 by Farrar, Straus, and Giroux as The Kandy-Kolored Tangerine-Flake Streamline Baby. The book became a bestseller and established Wolfe as a leading figure in the literary experiments in nonfiction that became known as New Journalism. In 1968 he published two bestsellers on the same day: The Pump House Gang, made up of more articles about life in the sixties, and The Electric Kool-Aid Acid Test, a nonfiction story of the hippie era. In 1970 he published Radical Chic & Mau-Mauing the Flak Catchers, a highly controversial book about racial friction in the United States. The first section was a detailed account of a party Leonard Bernstein gave for the Black Panthers in his Park Avenue duplex, and the second portrayed the inner workings of the government’s poverty program. In 1979 Wolfe completed a book he had been at work on for more than six years, an account of the rocket airplane experiments of the post-World War II era and the early space program focusing upon the psychology of the rocket pilots and the astronauts and the competition between them. The Right Stuff became a bestseller and won the American Book Award for nonfiction, the National Institute of Arts and Letters Harold Vursell Award for prose style, and the Columbia Journalism Award. . .
Wolfe had been illustrating his own work in newspapers and magazines since the 1950s, and in 1977 he began doing a monthly illustrated feature for Harper’s Magazine called “In Our Time.” The book In Our Time , published in 1980, featured these drawings and many others. In 1981 he wrote a companion to The Painted Word entitled From Bauhaus to Our House, about the world of American architecture. In 1984 and 1985 Wolfe wrote his first novel, The Bonfire of the Vanities, in serial form against a deadline of every two weeks for Rolling Stone magazine. It came out in book form in 1987. A story of the money-feverish 1980s in New York, The Bonfire of the Vanities was number one of the New York Times bestseller list for two months and remained on the list for more than a year, selling over 800,000 copies in hardcover. It also became the number-one bestselling paperback, with sales above two million. . . In 1996 Wolfe wrote the novella “Ambush at Fort Bragg” as a two-part series for Rolling Stone. In 1997 it was published as a book in France and Spain and as an audiotape in the United States. An account of a network television magazine show’s attempt to trap three soldiers at Fort Bragg into confessing to the murder of one of their comrades, it grew out of what had been intended as one theme in a novel Wolfe was working on at that time. The novel, A Man in Full, was published in November 1998. The book’s protagonists are a sixty-year-old Atlanta real estate developer whose empire has begun a grim slide toward bankruptcy and a twenty-three-year-old manual laborer who works in the freezer unit of a wholesale food warehouse in Alameda County, California, owned by the developer. Before the story ends, both have had to face the question of what is it that makes a man “a man in full” now, at the beginning of a new century and a new millennium. A Man in Full headed the New York Times bestseller list for ten weeks and has sold nearly 1.4 million copies in hardcover. The book’s tremendous commercial success, its enthusiastic welcome by reviewers, and Wolfe’s appearance on the cover of Time magazine in his trademark white suit plus a white homburg and white kid gloves-along with his claim that his sort of detailed realism was the future of the American novel, if it was going to have one-provoked a furious reaction among other American novelists, notably John Updike, Norman Mailer, and John Irving. In October 2000 Wolfe published Hooking Up, a collection of fiction and non-fiction concerning the turn of the new century, entitled Hooking Up. It included Ambush at Fort Bragg and, for the first time since their original publication in the Herald-Tribune, his famous essays on William Shawn and The New Yorker, “Tiny Mummies!” and “Lost in the Whichy Thickets.” His new novel I Am Charlotte Simmons, is now available in paperback from Picador. Wolfe lived in New York City with his wife, Sheila; his daughter, Alexandra; and his son, Tommy. Michael Lewis delves deep into the archives of the legendary reporter turned novelist to discover what made the man in the white suit the voice of a journalistic generation. I was 11 or maybe 12 years old when I discovered my parents’ bookshelves. They’d been invisible right up to the moment someone or something told me that the books on them were stuffed with dirty words and shocking behavior—a rumor whose truth was eventually confirmed by Portnoy’s Complaint. The book I still remember taking down from the shelf was Radical Chic & Mau-Mauing the Flak Catchers. The only word in the title I understood was “the.” The cover showed a picture of a bored-looking blonde housewife nestled in the lap of a virile black man. It seemed just the sort of thing to answer some questions I had about the facts of life. It didn’t. Instead, it described a cocktail party given in the late 1960s for the Black Panthers by Leonard Bernstein in his fancy New York City apartment. I’d never been to New York City, or heard of Leonard Bernstein, the conductor of the New York Philharmonic, and had only a vague notion of who or what a Black Panther revolutionary might be—and none of that turned out to matter. The book started out with this weird old guy, Leonard Bernstein, rising from his bed in the middle of the night and having a vision of himself delivering a speech to a packed concert hall while being heckled by a giant black man onstage beside him. I remember thinking: How would anyone know about someone else’s bizarre private vision? Was this one of those stories that really happened, like Bart Starr’s quarterback sneak to beat the Dallas Cowboys, or was it made up, like The Hardy Boys? Then, suddenly, I felt as if I were standing in Leonard Bernstein’s apartment watching his waiters serve appetizers to Black Panthers: . 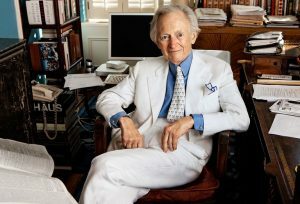 . .
Tom Wolfe, in his New York City study, in 2012. He started wearing white suits in 1962 because it was the custom in summer in his hometown of Richmond, Virginia. Photograph by Gasper Tringale. At some point came a thought that struck with the force of revelation: this book had been written by someone. Some human being must have sat down and scribbled the Hardy Boys series, along with the Legends of the NFL—how else would I have ever known that Dallas Cowboys defensive lineman Bob Lilly lifted a Volkswagen by himself? I’d never really stopped to ask who had written any of those books, because … well, because it didn’t matter to me who had written them. Their creators were invisible. They had no particular identity. No voice. Now rolling around a living-room floor in New Orleans, Louisiana, howling with laughter, I asked a new question: Who wrote this book? Thinking it might offer a clue, I searched the cover. Right there on the front was a name!!! Tom Wolfe. Who was Tom Wolfe? . . .
Thomas Kennerly Wolfe Jr. was born on March 2, 1930, and grew up in Richmond, Virginia, the son of a conservative, God-respectful southern editor of an agricultural trade magazine. Home was never something he was looking to get away from; it was never even something he was looking to pretend he was looking to get away from. He was accepted at Princeton but chose to attend Washington and Lee, to remain close to home. Every now and then one of his teachers would note that he had a way with words, and some artistic talent, but artistic ambition, for a conservative southern male in the 1950s or really any other time, was too vague and impractical to indulge. After college, he took the advice of his professor and went to Yale, for a doctorate in American studies—and right up to this point in his life there isn’t a trace of institutional rebellion in him. He pitches for the baseball team, pleases his teachers, has an ordinary, not artistic, group of pals, and is devoted to his mother and father. The moment he leaves the South, something comes over him. Whatever it is, the feeling seems to be heightened by the sight of a blank sheet of paper. For instance, he creates (while he’s meant to be writing a Yale dissertation) an elaborate parody of a Beat poet, “Jocko Thor,” complete with a small book of poems and a short biography. Jocko Thor has given birth to a “new poetic genre called Bonkism.” In his preface he explains: “Most of these poems were composed beneath a Coca-Cola sign in the town of Accident, Maryland, in February of 1956. They are dedicated to my childe bride whom I first met on that very spot.” There follows what is essentially a book of short poems written, it seems, purely for Wolfe’s own amusement—he never mentions them to anyone. . .
To this comes appended the genuinely shocked reviews of three Yale professors. It’s as if they can’t quite believe this seemingly sweet-natured and well-mannered southern boy has gone off halfcocked and ridiculed some of the biggest names in American literature. The Yale grad student had treated the deeply held political conviction of these great American artists as—well, as a ploy in a game of status seeking. This student seemed to have gone out of his way to turn these serious American intellectuals into figures of fun. “The result is more journalistically tendentious than scholarly…. Wolfe’s polemical rhetoric is … a chief consideration of my decision to fail the dissertation.” To top it all off … he’d taken some license with the details. He re-writes his thesis. He lards it up with academic jargon and creates a phony emotional distance from his material (he refers to “an American writer E. Hemingway”), and it is accepted. Then he flees Yale as fast as he can. He’s entering his late 20s with only the faintest idea of what he might do to earn a living. But he’s ambitious, eager to find his place in the world. His father introduces him to business associates. Wolfe writes to the head of a sales institute and sends “excerpts from work I have done on the subject of Communist activity among American writers and other ‘intellectuals.’” He applies for jobs in public relations. He writes to American Airlines to inquire about a post. He even considers, briefly, a position teaching economics. In short, he doesn’t have any clear idea of what to do, although he has long liked the notion of being a writer or an artist. In May of 1955 he had written to the dean of Washington and Lee University, “I am thinking very seriously of going into journalism or a related field,” but he was slow to pursue it, as he was sure it would disappoint his parents. He writes to one of his father’s friends and confesses what he really wants to be is a sportswriter. Finally, he sends letters and curricula vitae to newspapers, offering his services as either a journalist or a graphic artist. (As a child he had enjoyed drawing and still seems at this point in his life as interested in drawing as in writing.) Only one newspaper writes back to express interest: the Springfield Union, in eastern Massachusetts. In 1956, at the age of 26, he takes the job. A young man who had once assumed he’d become a professor now roams the streets of small-time America looking for car accidents or house fires or “color” stories—and he doesn’t seem at all troubled about it. There’s not a peep in his papers that suggests his parents are disappointed or that Wolfe is anxious about his career. Just the reverse: when he writes a story about the new fad of scuba diving and gets his picture in the paper in scuba gear, he is thrilled. He mails the clippings to his parents.